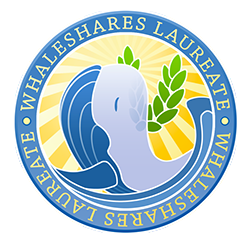 whaleshares.io is a Blockchain-Based Social Sharing Platform, that focuses on rewarding and sharing. Powerdown has been activated and you can now buy and sell wls. The second claim period has ended, and there is no announcement about whether a third claim period will take place or not. 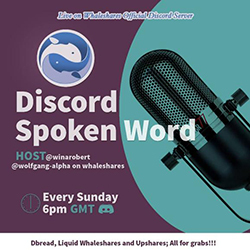 Our goal is to add value to the Whaleshares platform and the native WLS currency with the WhaleTokens allowing the users to share in the growth and earnings. To that end, we are requiring market pairings and trading to be disabled in order to remain listed and supported as an Official WhaleToken. This will help ensure the tokens are used to reward post content as they were intended. This is a round table discussion between host and co hosts about posts that are curated by them via the post-promotion channel in our discord. 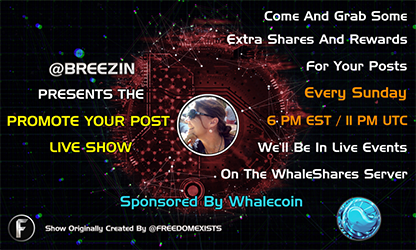 All posts that are discussed get a krazykoin reward and audience members receive krazykoin for tuning in. Every week a post would be dropped containing the theme of the contest. Participants are to come up with a poem or a short story/prose using this theme. Then during the show, contestants are to introduce themselves, tell us what the theme means to them and share your entry on voice.